I love fall and winter and I love to cook hearty stews and warming soups. One of the most important ingredients is stock or broth for your dish and homemade is the best. Most of the time spent making stock is hands off, it needs to simmer for a good 4 hours so prep time in the kitchen can be limited to about 1/2 hour. Cut most of that time in half by making the stock in your pressure cooker but I like the results better just simmered slowly on the back of the stove. (Besides it makes your house smell wonderful!) I’ve included a list of descriptives for stock, broth, stew, soup etc. And my recipe for a perfect stock; stock is made with bones and broth is made with pieces of meat and vegetables and is a little less hearty than stock. Keep some stock in your freezer for quick meals during the winter season. Recipe below but here are some descriptives of soups, stews etc. Bisque: a rich, thick usually smooth soup. Thickened either by pureeing or adding cream and usually made with some kind of seafood. Any fresh or frozen veggie can be used. Do not defrost vegetable before using, just toss it into the stock. Place the chicken into a large stockpot and cover with cold water. Bring to a boil over high heat; reduce to a simmer and skim any foam that rises to the surface. This should take about 15 minutes. 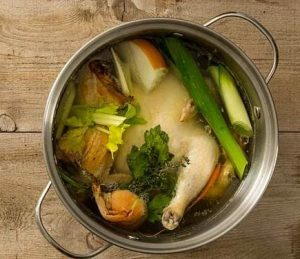 After removing any foam add the cider vinegar (for bone broth), vegetables and herbs, bring back to a boil, turn heat to a simmer and cook 2 – 2 ½ hrs. Remove from the heat and let the stock sit for 10 to 15 minutes, remove large chicken pieces and strain remaining stock through a cheesecloth-lined strainer. Cool by placing the container of strained stock in an ice water bath in the sink and then refrigerate overnight. The next day, remove the fat from the stock by skimming with a ladle. The stock will keep for 3 days in the refrigerator or 3 months in the freezer. Be sure to label and date before freezing. To adapt the recipe for Turkey Stock, roast a turkey back, neck, 2 wings and 1 package of chicken feet (yes, chicken feet have tons of flavor!) in the same manner as above. For a deep rich flavor you can brown all your chicken pieces and vegetables, if desired, before making stock. Place all pieces into the pot along with herbs, vegetables etc. Add 10 cups of cool water, cover and cook on high for 1 hour in your electric cooker. Let pressure cooker release naturally, strain and cool as above.